On April 7th, we announced a new version of Gmail for mobile for iPhone and Android-powered devices. Among the improvements was a complete redesign of the web application's underlying code which allows us to more rapidly develop and release new features that users have been asking for, as explained in our first post. We'd like to introduce The Iterative Webapp, a series where we will continue to release features for Gmail for mobile. Today: Faster address auto-completion and keyboard shortcuts. --Shyam Sheth, Product Manager, Google Mobile. At Google we're always looking for a way to do things faster. Today, we're announcing two improvements that will speed up your Gmail for mobile experience. The first improvement is faster address auto-completion. This means that as you begin typing the first few letters of your friend or colleague's name or email address, Gmail for mobile will quickly display possible contacts. We sped up this process by reusing previously fetched matches in subsequent searches. The second improvement is that we've enabled keyboard shortcuts for Android-powered devices with a physical keyboard. Now you can use all those familiar Gmail keyboard shortcuts to quickly move through your inbox. For example, if you're reading an email you can press 'u' to return to the inbox or 'n' to move to the next conversation. When is gmail going to get pushed based notificaton for iPhone or text new emails, or text notification for the iPhone. The technology and means is there so when's it going to happen? When all the stuff will be available to languages other than English? Is there any chance that this version of the site will get ported to the Palm Pre as well? Again, where is this nice gadget for Nokia devices, for example Nokia 5800 (which has touchscreen)? Dang, still no serious BlackBerry (Storm) love from Google. Guess I should be thankful for Google Maps at least. please can we have this for English (UK) language? we've been waiting ever since this was introduced. That's good news; still would really like an actual iPhone client, though. 1) Bigger reply button.... Instead of having Archive be the first button on the left when in an email message, REPLY should be there instead of having to scroll through the message to find the reply button. I'm constantly archiving messages, which means I have to go back through 3 screens (back, view labels then all mail). REPLY is probably the most used feature in email, so it would be nice if the reply button had easier access. It's really bad when the conversation has more than 2 messages in it. 2) It would be nice if you could "delete" right in a message using the delete button rather than tapping it and scrolling down to delete. Why is "mute" on an email message and why is it higher than delete? 3) Is there a way to delete an entry from auto-complete? The contact is out of my address book but I can't get rid of him in my auto-complete. Google, When is push gmail comming?????????????????????????????????????????????????????????????????????????????????????????????????? i'll echo Avi and ask when the Palm Pre is going to get these features. doesn't it use the same WebKit underpinnings? 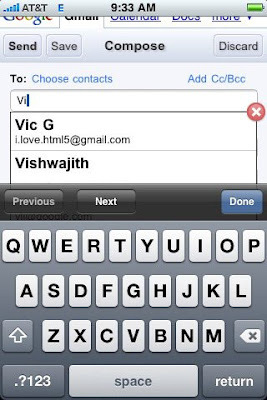 Can u please release a native Gmail app for the iPhone? The current Mail app does not keep the conversation threaded and the current Gmail web app does not show badges for new mail. Please release a native app. The Gmail mobile/web team is really adding some great usability features for the webkit browsers on the iPhone and Android machines. My question is, if the Nokia devices (at least recent ones) also support webkit - why aren't you enabling these same features for Nokia phones as well? If it is a touch relevant development, then will the N97/Nokia 5800 touch series phones from Nokia work with your new features? Lastly, if they are html5 based features, are the Nokia browsers html5 capable? I know I have asked you a lot of questions but I wanted to know some insight into your team's thought process behind Nokia support as I planning to buy the N97 AT&T 3G version. I might just have to wait it out with one more Nokia device until you release an Android handset that satisfies both my primary requirements. Lastly, if this is not the best place to pose my questions to you - then where should I field them? As an avid Gmail/Google Apps user I must say that it is extremely disappointing to not see a native Gmail application for the iPhone. To me the point of Gmail is threading. The point of the iPhone is native applications and soon push notifications. Threading doesn't work with the iPhone mail client, and notification of any type doesn't work with this web client. This is simply WAY off base and pretty surprising to see a company like Google continue to miss the mark on what's possible with the iPhone. Surprisingly enough Yahoo support on the iPhone is fantastic. And there is not an Android device available for AT&T. Even when there is, the App Store is unmatched to me and I'd prefer the iPhone. I really appreciate your continued work on this, but you are patching a flawed idea. No one wants to use Gmail in a web interface on the iPhone. When are you going to fix it? Gee - all these snappy features and yet it STILL does not render graphics and pics properly. What a let down. How about fixing the darned thing before adding yet more features.